Walter J. Kohler, Sr. founded his Tudor-style hotel to provide lodging for immigrant laborers who worked at Kohler Co. Today, the hotel stands as a testament to Kohler's commitment to the people living in the town of Kohler, Wisconsin, and the people who come to visit. The concept of gracious living has long been a Kohler Co. mainstay, spread by its innovative, world-famous bathroom designs, a concept that also served as the guiding force behind the 1981 renovations to The American Club. The American Club's oak-paneled hallways display antiques from the town's varied history, as well as Americana and photographs of the area's earlier days. The hotel and its modest-sized town has everything for the discerning traveler: Whistling Straits and Blackwolf Run, four world-class golf courses designed by Pete Dye, a 500-acre nature preserve, the Kohler Design Center, a sports center and racquet club, spa treatments at the Kohler Waters Spa and the Shops at Woodlake Kohler. 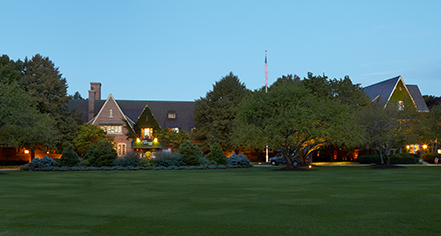 More importantly, each of the 240 rooms within the American Club has been outfitted in the Tudor style, along with a state-of-the-art Kohler showering experience or whirlpool tub in each bathroom, details that make this hotel rise above the rest. 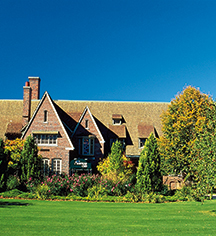 The American Club, a member of Historic Hotels of America since 1991, dates back to 1918. The Tudor-style residence was carefully named in the hope that it would instill in its residents a love of their new country. Adjoining Rooms: Available. Please notify request at time of booking. Hotel/Resort Fees & Taxes: 6% resort fee includes: Wireless internet, Shuttle services throughout the resort, Access to Sports Core Health and Racquet Club, Business Center access, Morning coffee and afternoon tea, Welcome beverage, Valet parking, Underground and surface parking, and Gaming systems. Taxes: 10.5%. Shuttle Service: Compllimentary On-Demand 24/7 in Village of Kohler. Walter J. Kohler, Sr. founded his Tudor-style hotel to provide lodging for immigrant laborers who worked at Kohler Co. Today, the hotel stands as a testament to Kohler's commitment to the people living in the town of Kohler, Wisconsin, and the people who come to visit. The concept of gracious living has long been a Kohler Co. Learn more about the History of The American Club .